Find games like Torchlight on our page which offers some of the best in the action RPG genre for solo adventurers or ones who prefer to travel with friends. 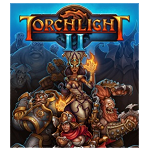 Torchlight is a fantasy themed action role playing game that is considered to fall on the more casual side of the spectrum. With a development team that had previously worked on the likes of Fate and the first two Diablo games you know that Torchlight is a great experience (one that you are now looking to relive through a similar game). Torchlight’s gameplay focuses on simplicity but still has plenty of depth for any adventurer that is willing to dig deeper. The Torchlight games centre around a town hub where players can equip themselves for their travels ahead, accept quests and sell any random wares that have been dropped on the dungeon floors by enemies. Staples of the Torchlight series have included randomised loot, randomised dungeons, boss battles, fishing and a pet system. The games available classes also try to move away from the standard archetypes that most action role playing games offer. The games like Torchlight that you’ll find here are mostly geared towards a casual gaming audience with a mixture of single player and multiplayer options.